The men’s canoe polo was one of the highlights of my weekend – different to any sport I’ve ever seen, and more savage than you would imagine! 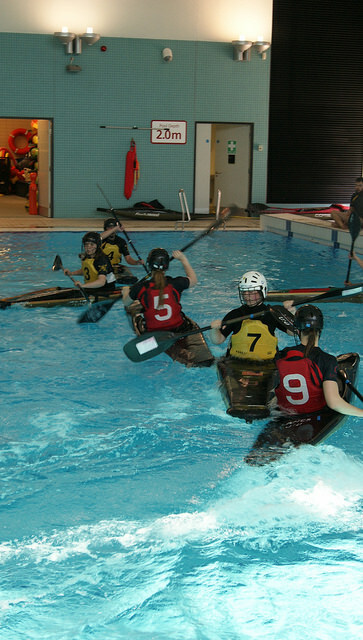 The concept is exactly as it sounds: individual canoes in the sports centre swimming pool, filled with movement, goals and lots of splashing! The game was dominated by the Lancaster team, who won 7 points to York’s 0. The goals were fended off by Lancaster’s goalie, using a paddle to bat the ball away from the raised net. The game was relatively short and full of drama, which was refreshing to see from a sports team. Overall, the Lancaster men’s team smashed (or shall I say splashed?) the York team out of the water, in a very fast paced and exciting match.